Happy Friday! How many days until spring? About 38 or so? I can't wait! But for now, here are some of my winter favorites. For some reason, I was really craving fajitas at the start of the new year so I picked up ingredients from Trader Joe's and kind of just threw together a recipe that ended up being really good. I used the pre-cooked chicken breasts, one lime, bell peppers (1 yellow, 1 green), Trader Joe's Everyday Seasoning, coconut aminos, and the Healthy 8 Veggie Mix. All you have to do is slice up the pre-cooked chicken breast and add to a pan with a bit of olive oil to brown. Add in the sliced bell peppers next and season with Everyday Seasoning (it contains everything you need---paprika, chili powder, cumin, etc. ), the juice of one lime, and a splash of coconut aminos. Towards the end, I threw in a handful of Healthy 8 Veggie Mix to get more greens and a little more flavor. So good! I'm honestly surprised that my favorite winter candle is only $3.99 but this one from Trader Joe's is just so good! The smell is perfect for the holidays and it actually lasts quite a while. I had brunch at The Wren recently and it's so cozy! You can read more about that experience here, but I highly recommend this place for a winter brunch. I also recently discovered Sweethaus in Williamsburg (read more here) and am totally obsessed. It's such a cute little spot with delicious food and the best music. I had a few glasses of wine at this bar in the East Village a few weeks ago and fell in love with the place. It takes a lot for me to like a bar, so this is a rather big deal. Swift's is super cozy, inspired by Jonathan Swift, and feels a little bit like something out of a Harry Potter novel. I've been listening to the song "iT" by Christine & The Queens on repeat for years now but, for some reason, never listened to the rest of her album until my friend Diana mentioned it and now I'm obsessed. Heloise is such an incredible artist and performer! I've also been listening to the Nocturnal Animals soundtrack a lot during my commute because it feels very cinematic and makes the trip more exciting. If you know me, you know by now that I'm totally head over heels for Luca Guadagnino's film Call Me By Your Name. I saw it back in early December and have truly not stopped thinking about it since. There are so many reasons I love this film, both personal reasons and cinematic reasons. It's in wide release now, so everyone go see it! I've also fallen in love with Paddington! I've heard everyone raving about the sequel, so I watched the original on Netflix and it seriously warmed my heart. My brother and future sister-in-law got me a Passion Planner for Christmas and, you guys, it's amazing. Have you seen these? Sure, they're planners but they're very goal-oriented. They have all sorts of little sections throughout that help you track your goals and then a set of reflection prompts at the end of each month. There are so many creative things you can do with these planners, so I've stocked up on colored pens and Washi tape. Would you guys like a post on how I set up my planner? 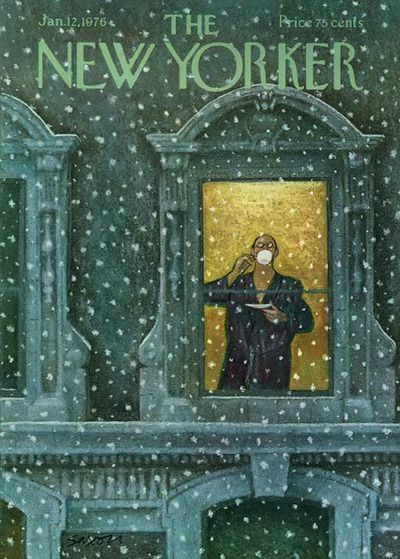 I love The New Yorker covers and have a whole board on Pinterest dedicated to them. This specific one from the 70s was my favorite piece of art this winter.